Credit Rating Agencies we mean an agency providing rating of “credit” taken by any company i.e. if any company wants to take any loan from the market they hire a credit rating agency to rate their loan so that the intended person providing the loan will have a fair idea about the risk associated with the loan they are providing to the company. These credit rating agencies came to use in the market from early 20th Century when three rating agencies were formed which are Standard & Poor’s (S&P), Fitch and Moody’s, later on, many more credit rating agencies came into existence. When any company wants to issue any bonds or securities into the market, they tend to rate this debt instrument by any Credit Rating Agency so that they can attract more customers. Higher the rating of the debt lower is the risk associated with that debt and vice-versa. The intended buyer of the debt instrument often looks at the credit rating of the debt before investing their funds so that they can have a fair idea about the risk associated with their investments. Subjective evaluation of the capacity of the company to repay the debt. Overall total debt of the company and its impact on the financial position. A thorough analysis of the finances of the company to ascertain the areas through which the principal and interest would be paid. Past debt repayment history of the company. A general study of the economy and industry in which the company is operating. The willingness of the company to repay its debt. The above list is indicative and not exhaustive, and there are various other factors considered by credit rating agencies before giving a certificate on their credit rating. While issuing the rating certificate they also give an annexure wherein details are provided as to what assumptions they have taken or the method they have chosen to arrive at the ratings. However, there can be another grading also adopted by the agencies that shall be given in details in their report. But the basic fundamental remains the same – Highest – High – Moderate – Weak – Poor – Default. 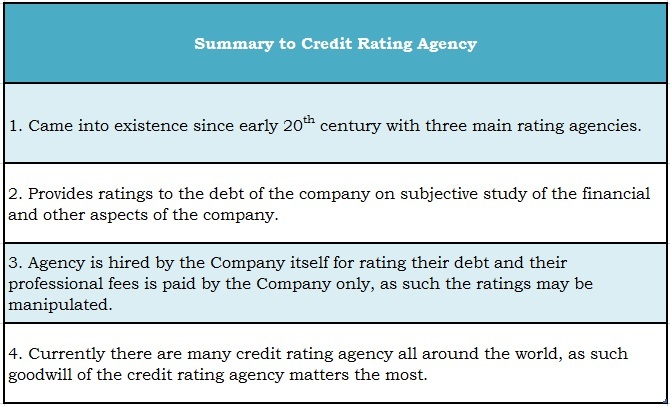 In this article, we will cover a list of credit rating agencies sites in the world. Credit rating is an important aspect of securities, especially bonds. There are several rating agencies in the world that analyze and give ratings to bonds and other securities. Let’s see the credit rating agencies listed as per their country. 1. A.M. Best Company, Inc.
5. Kroll Bond Rating Agency, Inc.
1. BRC Investor Services S.A.
1. Chengxin International Credit Rating Co., Ltd.
2. China Lianhe Credit Rating, Co. Ltd.
3. Dagong Global Credit Rating Co., Ltd.
4. Shanghai Credit Information Services Co., Ltd.
5. Shanghai Far East Credit Rating Co., Ltd.
1. Istanbul International Rating Services, Inc.
2. JCR Avrasya Derecelendime A.S.
3. Kobirate Uluslararası Kredi Derecelendirme ve Kurumsal Yönetim Hizmetleri A.Ş. 5. TCR Kurumsal Yonetim ve Kredi Derecelendirme Hizmetleri A.S.
1. Agusto & Co. Ltd.
4. ONICRA Credit Rating Agency of India, Ltd.
1. HR Ratings de Mexico, S.A. de C.V.
1. Bank Watch Ratings S.A.
2. Mikuni & Co., Ltd.
4. Seoul Credit Rating & Information, Inc.
1. Apoyo & Asociados Internacionales S.A.C. This is a partial list. You may Google to find out credit rating agencies in other countries. To sum up in today’s date credit rating agencies play an important role in debt instruments, investors often decide on their investment decision based on the ratings provided by the credit rating agencies since it is third party rating and an unbiased one. At the same time it also has its limitations since the method of ratings are not universal each rating agency can have their methodology of ratings the debt of the company further, the company themselves appoint the agencies to rate their debt, and the payment is made by the company, so there are chances that the company manipulates the agencies to obtain a better credit rating. So it's up to the investors to decide on the ratings and as such the goodwill of the rating agencies matters the most. what would be better option for career in advancement? I’m really pleased. Thank you so much. Thank u very much for ur kind and important information. It is very good site from where I got enough information about the financial market and finance career. Thanks a lot for analytics Teams. Thanks for the appreciation and kind words. Keep visiting the site.